48 for $62.50 total Need more quantities? We love the way 'Beth Evans' perches along stone steps at our store and multiplies on its own each year. 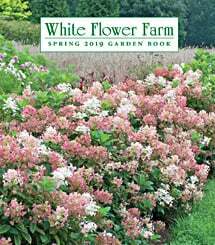 Her clusters of 3/4″ tubular pink blooms flushed with white appear in early spring. The finely divided, gray-green leaves go dormant in summer heat, so remember where you've planted the tubers (or just replant them if you dig them up inadvertently). The genus Corydalis, having 300 far-flung species, bears small, spurred blooms that will be familiar to anyone who loves Bleeding Heart. Flowering ranges from late spring to fall on short spikes that decorate a cool mound of handsomely cut foliage. Most grow best in partial shade and evenly moist soil and may go dormant in the heat of summer. They are useful for edging borders or walkways. For information on the growing and care of Corydalis, click Growing Guide. Easy in partial shade or shade and evenly moist soil. C. 'Blue Panda' may go dormant in the heat of summer, then reemerge in fall. C. lutea self-sows without becoming a pest; you can also collect seeds as they ripen and scatter them where you'd like more plants.